I received this book years ago as a child, when my grandfather passed away. It was a comforting read, explaining what death and Heaven mean. I just dropped off some books at a used book store and started browsing. Saw this sitting on the children's shelf, so I read it. It was pretty cute, nice illustrations, but I had a major theological problem with it, so I think if I had kids, I probably wouldn't pick this one to read to them.The mother tells the little girl that she believes something like "if you're good for most of your life, you'll go to Heaven." It's not really about "being good," for most of your life, though, imo... it's about whether the love of God is in your heart and whether you've really repented of the wrong things you've done. It seems that teachings like that in this book are what can trigger a lifetime of perfectionism and over-religiousness... a slippery slope to judging other people who are not so "good."Bleh. Brief Summary: This book is about a little girl who learns of her great-grandmother's death and proceeds to ask her mother many questions about death, heaven, afterlife, and grief. She learns how to accept death in the end of the book and embrace the spirit of the one lost. Genre: realistic fictionReading Level: This book is for transitional readers because it has whole pages of text, complex sentences and a variety of words such as: cousins, funeral, and differently. Topic: death, grief, afterlife, coming to termsCurriculum Uses: I would use this as a read aloud if the children were having trouble understanding death. I would also use it as an independent read for a fluent reader. Other uses would include adding it to a guided reading group’s book list. The group would be based on dealing with tough issues such as death.Literary Elements: The author uses metaphors and similes to describe heaven and souls. The author also uses dialogue to describe character traits and actions. The author also establishes the mood in the book through the choice of setting, details, and images. Social Issues: Afterlife, religionIllustrations and Text: The illustrations in this text do not support the text very closely but they are uplifting and peaceful. They convey the somber mood that is established by the author in the book. Kate is a young girl whose great-grandmother has died. Her mother states that she’s gone to Heaven. Kate inquires, “What’s Heaven?” Her inquisitive nature leads to further discussion. She asks more questions in response to her mom’s answers. She learns more about Heaven and related concepts, expresses some thought provoking questions and responses, and draws a few conclusions for herself. This is a good book to have on hand for parents, children, and anyone looking for answers after the death of a loved one. The story incorporates questions asked by Shriver’s own children, nieces, and nephews at the death of their great grandmother. This emotional and complicated subject is treated with simplicity, gentleness, and compassion. I think people of all faiths can use this book as a starting point for discussions. The accompanying pastel illustrations complement the story beautifully. I found this book at the library today when looking for a way to explain my grandfather's death to my 5 and 3 year-old kids. It was perfect... well, maybe except for the part where there's a pet heaven and a people heaven... but they're too young to understand that difference anyway. The only real problem was that I couldn't make it through the book without having to stop and compose myself. The story beautifully explains the concept of a soul and how our bodies remain after death but our souls go on to live forever. It also talked about a funeral and, briefly, the process of grief. I had no idea how to address the topic myself, so this book was a great way to open the conversation with the kids, and we'll be able to continue to refer to it as we approach the funeral. I loved how this story showed an important and loving discussion about a subject that is so difficult for a child to understand and maybe equally as hard for a parent to explain. After reading this book together a couple of times, it opened up several conversations with my 6 year old son about the concept of death and the world thereafter. Different ideas and beliefs were shared concerning our family's loss. And these conversations continue to happen with the freedom to have an open mind to more thoughts about angels, souls, spirits, etc. This story was about a little girl whose great grandma had died and she keeps asking questions about what heaven is. Many kids can relate to this because they always ask questions since they are trying to understand what people mean. The pictures in this book were beautiful and soft toned. The writing was bolded when there was something important trying to be pointed out. It was mostly conversations between little girl and her family members. I would have loved to have a book like this when I was younger and I would have known that asking questions was okay. Literary Elements: Onomatopoeia; character: Kate is a curious little girl who has lots of questions, especially about Heaven. I would use this book for occasions if one of my students has experienced a loss (in a private school, of course). I know it helped me a lot when I was little to understand where my dad went. It has a thorough explanation of Heaven and how to cope with death. This book is about explaining the topic of death and Heaven with children. Children and some adults do not really understand Heaven well. She tells children Heaven is a beautiful place, where no one is sick, or mean, or unhappy. It is a place we can't see but we believe in. She explains death in a gentle and loving way. Maria Shriver makes a valiant and caring stab at a difficult subject matter.Even though she tries to encompass all faiths in her text, it is worth a read. Picture book for adults. A good quick short story. Nice pictures and story line is very sweet and nicely done. Simple explanation for a death and funeral and the idea of Heaven. Easily understood by young children. Read to my boys tonight. 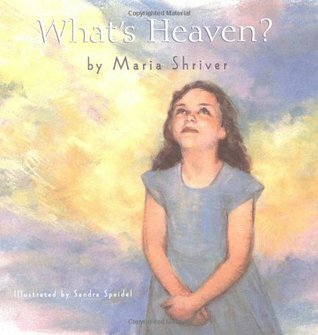 Maria Shriver wrote this heartfelt book based on the explainations of questions from the death of her grandmother by her childen,nieces and nephews. With a great-grandmother's death recently in our own family this book was recommended to me. It very gently and honestly answers the questions a child has about the death of her great-grandmother. Loved it and lent it to friends going through the loss of a loved one. Terrific for kids. This book was given to my girls when my mom - their grandma - died. They were not interested in it, but it was a nice explanation of the life after death. Let's children know they are not alone. Excellent story for young children who have lost a grandparent. Also, very touching for the adult too.